In this video we will discuss error handling in Angular. This is continuation to Part 27. Please watch Part 27 from Angular 2 tutorial before proceeding. When using http, to call a web service, errors may occur. When they do occur we want to handle these errors. 1. We use the catch operator to catch any exceptions that occur. 2. Before we use the catch operator we have to import it, just like how we imported map operator. 3. The catch operator can then be chained to the map operator. 4. To the catch operator we are passing another method (handleError). This handleError() method is called when there is an exception. 5. In a real world application we may pass the error to a logging service to log the error to a file or a database table, so the developers can see these errors and fix them if required. 6. In our case, to keep things simple we are logging to the browser console. 7. Since we want the error message color to be red so it stands out, we are using console.error() method instead of console.log() method to log the error to the browser console. 8. After we log the error, we are throwing the error back, so the components that use this service are notified about the error condition, so they can display a meaningful error message to the user. We are calling this service from EmployeeListComponent. So we need to handle the error we have thrown from the service and display a meaningful message to the user. We are subscribing to the service, in ngOnInit() life cycle hook of EmployeeListComponent. Notice there are 2 parameters to the subscribe() function. Both these parameters are arrow functions. The first arrow function is called when the Observable successfully emits an item. The second arrow function is called, when there is an error. // "Problem with the service. Please try again after sometime"
At this point when you reload the page in the browser, you will see the message "Loading data. Please wait...", but the data never loads. 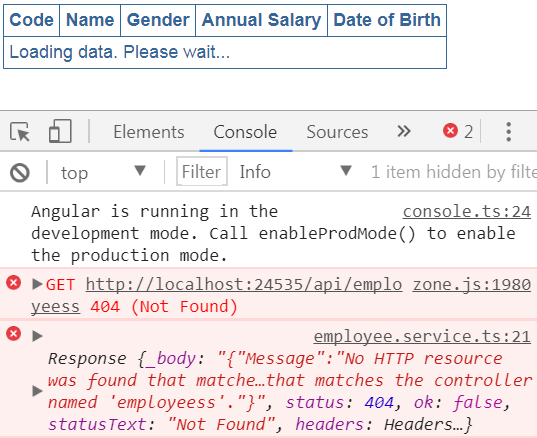 Now launch browser developer tools and you will see the error message logged to the console by the service. This message - "Loading data. Please wait..." is misleading in this case. Instead we should be displaying a meaningful message like - "Problem with the service. Please try again after sometime". To do this in the view template of EmployeeListComponent (employeeList.component.html) bind to statusMessage property of the EmployeeListComponent class as shown below. With the above change, while the service is busy retrieving data, we see the message "Loading data. Please wait..." and if there is an error we see the message "Problem with the service. Please try again after sometime"
If you comment the following import statement in employee.service.ts, the exception handling still works as expected. However, without the above import statement in employee.service.ts file, if you try to log the error object to the console in ngOnInit() method of EmployeeListComponent as shown below, the logging does not work as expected. With the above change notice the second error message logged to the console. 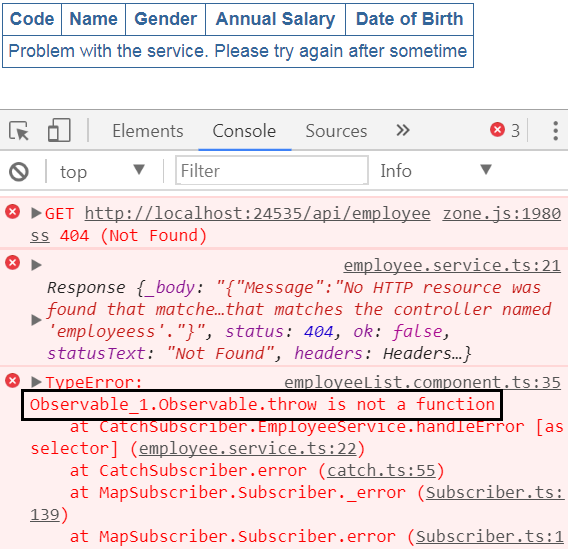 You will see a message stating - observable_1.observable.throw is not a function, which is not the error message we expected. Angular is complaining that it cannot find throw. If you uncomment the import statement in employee.service.ts file, then we see the error message we expect. I should change the port 24535 to the port my service uses or the port my web app uses?